I’ve edged up the anticipation by a week because I’m hosting my annual Friendsgiving tomorrow night. I’m pretty much set to go because I only have to worry about the main course (we do it pot-luck style), but you might be looking for some last-minute recipe inspiration. 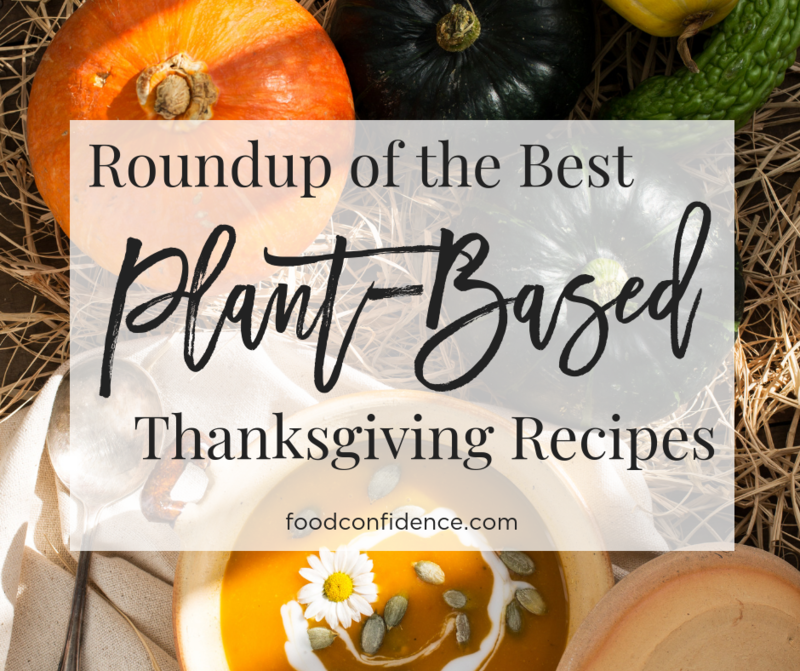 Here are a few of few of my favorite tried-and-true, plant-based Thanksgiving recipes. I know, I know…who wants to eat “plant-based” on Thanksgiving? And yes, there’s always that one person in the family that will stick their nose up to anything “plant-based” on the table (I’m looking at you, my dear brother). But I swear to you, these recipes are a game changer. You can make at home or bring them to wherever you’re going and no one would even guess that they were “plant-based.” My trick? Tell them after they devour their plate. Or don’t ever tell them at all – what they don’t know won’t hurt them! I don’t know about you, but I love me some spinach dip. It’s the perfect way to sneak in some greens and it makes the best dip with a tray of gorgeous crudités (aka cut of veggies). 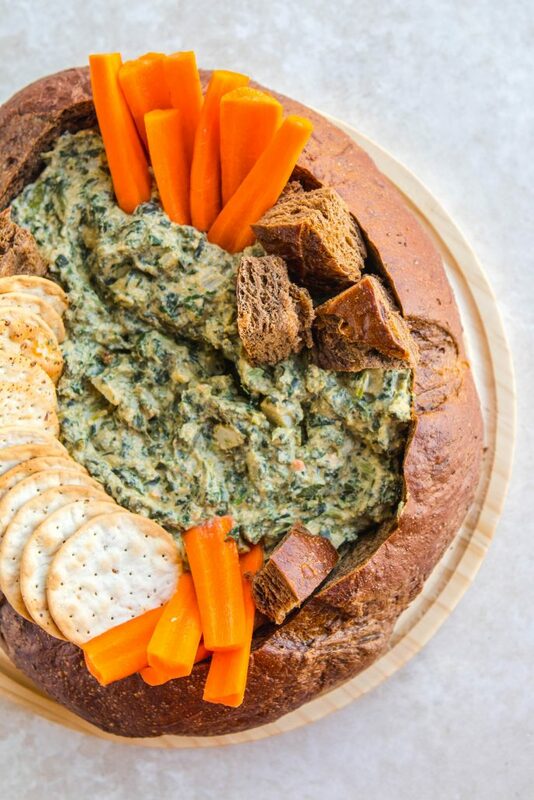 This dip will please any meat eater and it’s even better in a pumpernickel bread bowl! Seriously, if you’re going to make this dip, I highly recommend going the extra mile and putting it in a bread bowl. It takes 5 extra minutes but makes a huge difference! The pumpernickel flavor compliments the spinach dip perfectly. Plus it’s a fun way to make dip more exciting to look at (and eat). Just don’t fight over who gets to eat the bowl after the dip is devoured! 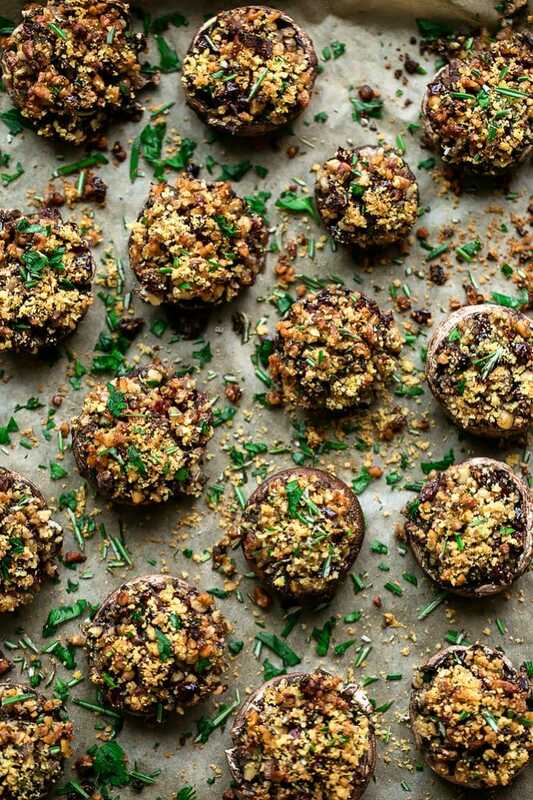 These vegan walnut, sage & cranberry stuffed holiday mushrooms are a great appetizer. The flavors in this recipe simply scream Thanksgiving. Plus, they come together in no time and it’s super simple to double or triple the recipe for a big crowd! My mom always makes stuffed mushrooms at Thanksgiving, so this one takes me right back to my childhood. Are you looking to wow your guests with your presentation skills? Then this is totally the recipe for you. Who doesn’t want to eat out of a mini pumpkin on Thanksgiving? 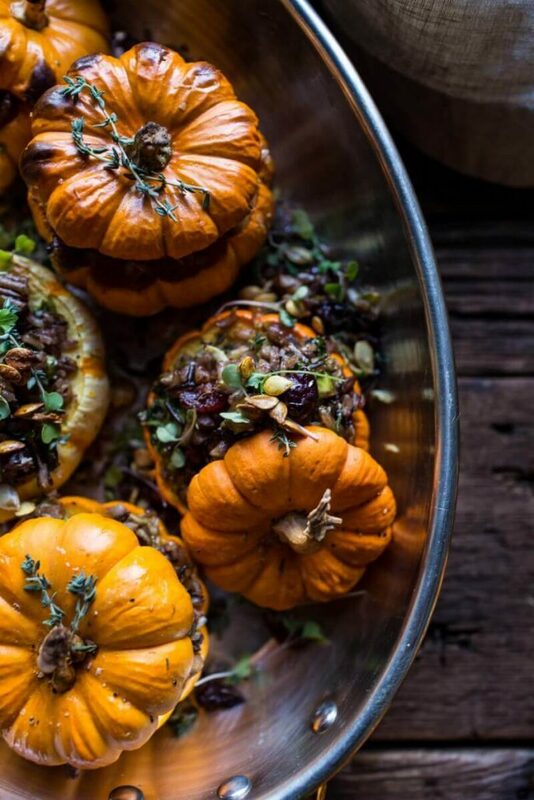 Especially when that mini pumpkin is full of nutty wild rice and shredded Brussels sprouts! I love to serve a wild rice dish at Thanksgiving; there’s something about the flavor, texture, and aroma of wild rice that screams…autumn. Psst… Check out my latest edition of Formula Meals for more stuffed squash recipes. This Thanksgiving Holiday Roast has it all. Seriously. There are multiple Thanksgiving dishes all wrapped up in one “roast.” Apple cranberry sauce. Sweet potato mash. Mushroom and lentil stew. Every holiday flavor is accounted for here! This is the type of creativity and flavor that is guaranteed to wow everyone at the table. This side dish is jam packed with veggies and would make a great addition to your holiday spread! This is probably one of the more obviously plant-forward recipes on the list, but it’s perfect if you have a lot of different eaters coming to dinner. 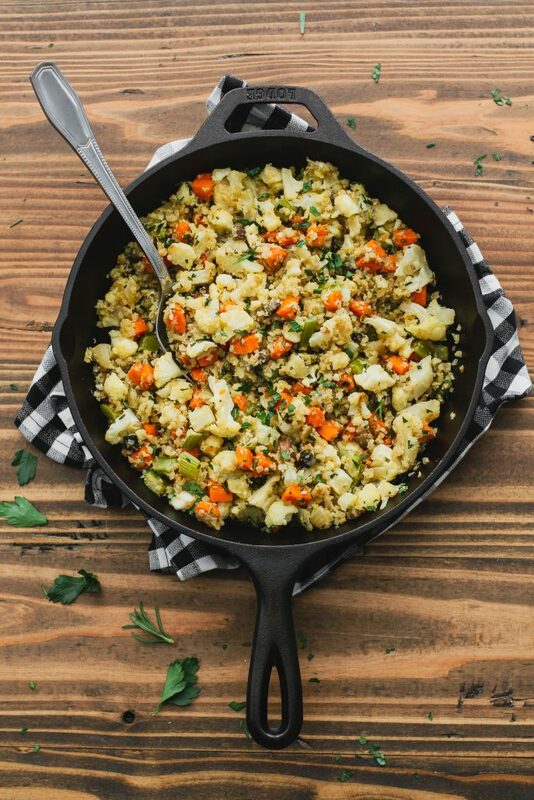 This recipe is also free of most allergens, gluten, grains and is vegan and paleo. And it’s absolutely delicious. Yup, you read that correctly. Crispy. Pesto. Onions. I’m not kidding. How have I never thought to put pesto into green bean casserole?! 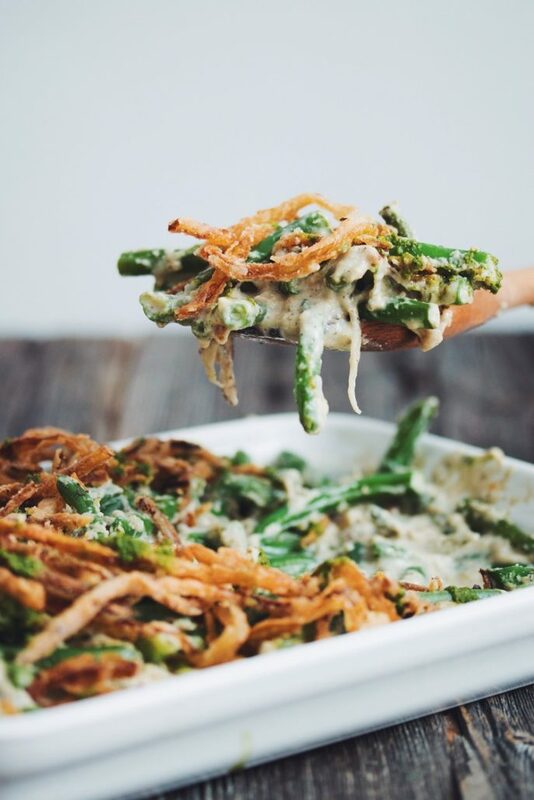 Pesto takes your plain old green bean casserole to the next level! 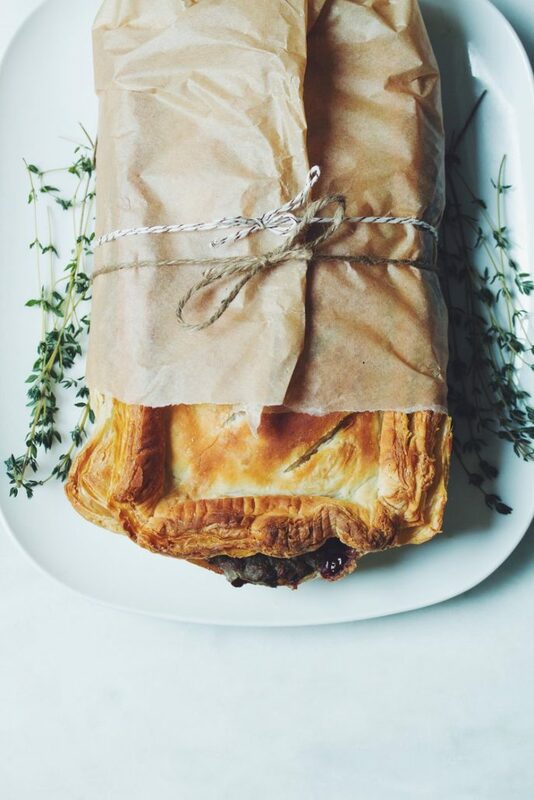 This is a great way to combine tradition and creativity at your holiday table. Okay, let’s be honest. Biscuits are nearly always the star of the show at the holiday table. For me, anyway. Is there anything better than warm, fresh biscuits straight out of the oven? If you’re only going to be making and eating fresh biscuits a handful of times throughout the year, you have to make it count! 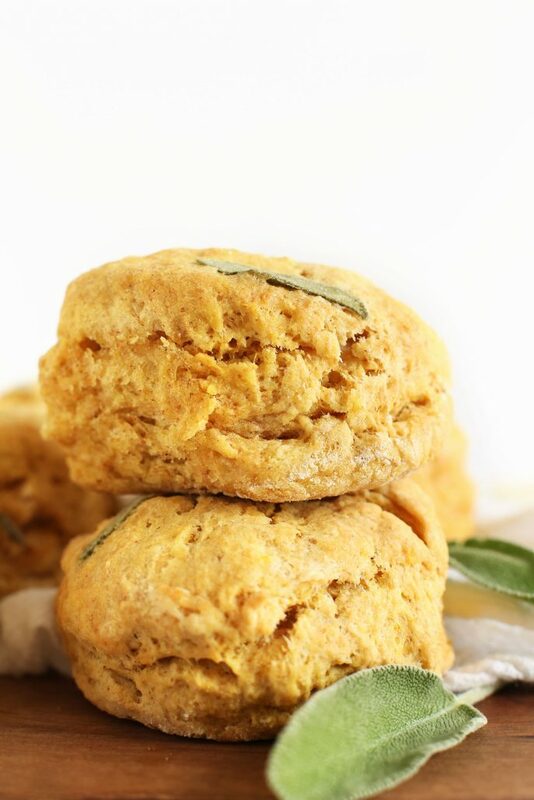 These pumpkin sage biscuits are particularly perfect for Thanksgiving because they are filled with tasty autumn flavors. 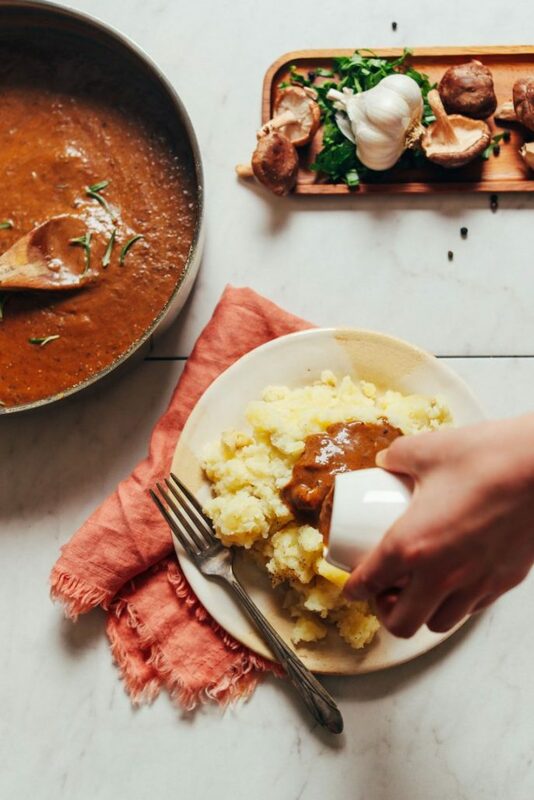 Would it really be Thanksgiving without gravy? Nope. Let me warn you now, you cannot serve a Thanksgiving meal to your family without gravy and have nobody notice! This is a must-have recipe to keep around for the holidays. Plus it’s perfect to dip your biscuits in (imagine dipping those pumpkin sage biscuits in this gravy!) or pair with mashed potatoes. 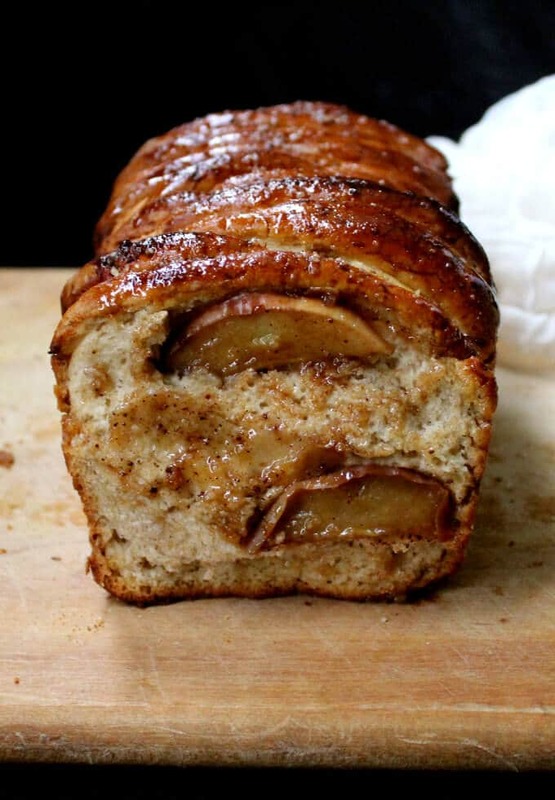 First of all, isn’t this apple pull-apart bread just fun to look at?! And it’s fun to bake… and eat! This is a nonnegotiable at Thanksgiving. I’m fairly certain my friends would stop coming if I didn’t make this every year. Another plus? It’s vegan and free of soy and nuts so you can serve it to nearly everyone. But I promise, no one would ever know! It’s not Thanksgiving if there’s no pumpkin pie! It’s a classic for a reason. 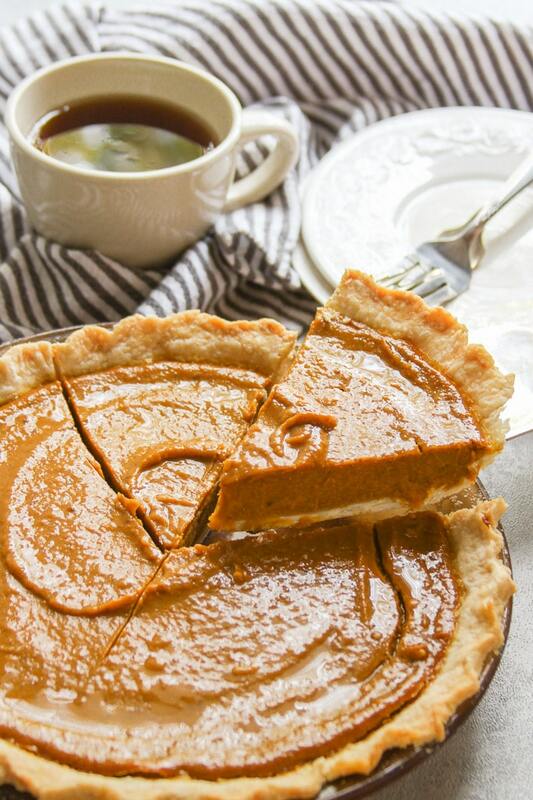 Pumpkin pie is rich and custardy – the perfect way to wrap up a good day of eating! There’s nothing like eating a platter of your favorite Thanksgiving dishes and returning to the dinner table with a cup of coffee and a slice of beloved pumpkin pie. Looking for even more Thanksgiving inspiration? Last year I put together a roundup of instant pot recipes for Thanksgiving. The instant pot is the perfect solution for Thanksgiving because recipes that normally take hours come together in just minutes. You can also set it and forget it while you’re prepping other dishes, setting the table, or just taking a break from the kitchen. 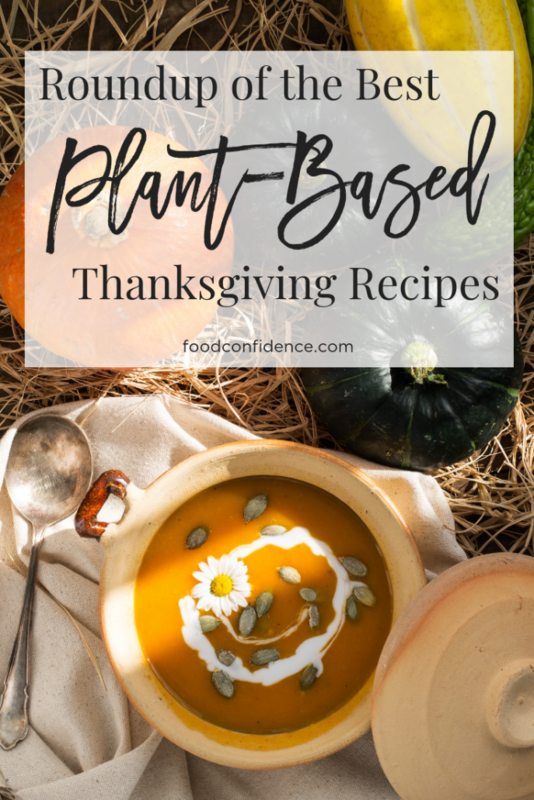 Make your family these AMAZING plant-based #Thanksgiving recipes this year!